Ultras-Tifo.net have done a interview with a member Fratria, Spartak Moscow. 1. sem, member of Fratria. UT: Tell us a bit of the history of Fratria? 2. Fratria as organization was established two years ago by the most active members of red-white hooligans firms and associations. A huge work had been done during that time. We had overcome a way which took much more time from other fan-organizations (more than 10 years). The first attempt was made in spring 2005 during the derby-match with CSKA. About 20.000 red and white T-shirts. About 200 000 (!) balloons, approximately 60 000 people. UT: What is the meaning of the name Fratria? 3. Fratria in Latin means «Brotherhood». This name is used because we try to make real brotherhood on our stands and we use slogan «One for all and all for one». 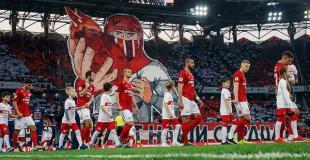 Fratria – it’s not just several men who make performance, but it is everyone from 20000 who come to stand B of Luzhniki stadium (our stadium) to support Spartak Moscow. We aspire to be a uniform organism. UT: Tell us a bit about the scene in Russia, How did it start? 4. Two-three years ago there was no also a speech about any organized support in Russia. Fans actively swung muscles in the training-halls, beat each other faces and our hool-scene blossomed as never. The first performance on Russian terraces has happened on the CSKA stadium in far 2002. However this action was not an idea of red-blue fans, and was completely executed under the decree of the president of CSKA Giner. This action had not been noticed by our fan-public. And in 2004 the group "Reactive" (FC Locomotive) on game with FC CSKA was made with the first organized ultras-show in Russia. Ultras-group "Reactive" had declared that they had nothing common with hooliganism in general. So they also have concentrated on a support of the team. Russian ultras-movement is at a high level at present. Leaders are Spartak, Zenit, Locomotive and CSKA. However there exists an interest to ultras-show in province, and not only in premier-league (Rostov, Rubin, Krylja Sovetov, Amkar), but also among fans of commands of the first (a Torpedo, the Dynamo Bryansk, Alanija) and the second divisions too. UT: How is the daily live in Moscow with so many rivals? 5. Moscow is very large city (with population about 12 mln.). There are a lot of people who want to do picturesque shows and to be hooligans. And everybody wants to be the best in their sphere. That is why we must keep a high level in all our actions (ultras and hools). UT: Who are you rivals? And do you have ultra group where you are friends with? How did that grow? 6. Main our enemy at present is CSKA. To the matches with this command we usually begin prepare some months prior to game – this match is the main derby in Russia. There is no matter what position do teams take, this matches will always take the most interest. However there is that unites us – that we all Russians. On the last match with CSKA were organized ”minute of silence” and banners in memory of two victims of automobile crush from CSKA hooligans firm Yaroslavka. After that tribunes have mutually thanked each other with an applause. Besides our enemies are fans of Dynamo, Locomotive and Zenit. Burn scarfs of the CSKA, Dynamo and Zenit on the match with Rubin in Kazan. In Russia our friends are Orel-fans (eng. equ. Eagle). Finally attitudes were not issued with fans of Torpedo Moscow and FC Rostov. Our friends in Europe are Crvena Zvezda from Beograde (Serbia) and Lech Poznan (Poland). Our relationships with Crvena Zvezda have been started after visiting Spartak fans the match between CZ and Partizan in Serbia. The main thing forced fans of CSKA and Spartak stand all together against common enemy was the tragedy of Serbian people. The march 24, 1999 – day when NATO began bombing Yugoslavia, all Moscow fans and hooligans had forgotten all their wars and struggles and united to express the civil position on this question.. «Yu-go-slavia! Yu-go-slavia! » - they shouted near the USA embassy. The flag of Russian Empire (non-official Russian flag) on CZ game in Serbia. The history of our friendship with Lech Poznan is rather short. However it’s not friendship of all fans of Spartak and Lech. Just their hooligans. 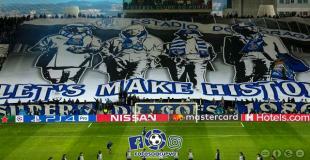 Banner of Lech-supporters on the Champions League match in Liberec. Our flag on the Lech terraces. UT: How is your opinion about violence and are you an violent group ? The management of Fratria is carried out by leaders of all hooligans associations: The Union, Gladiators Firm, Independent Crowd, Devils Band, Wild Boars, Boxer’s Team, and Opposition. However itself Fratria does not take part in any hooligans actions. 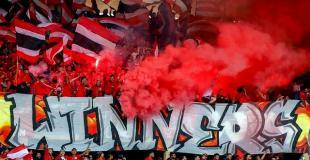 The main purpose of Fratria is creation of shows on terraces and strengthening of a brotherhood between fans. UT: How is the relation to your club ? 8. At present there are no attitudes with club. The management of the club doesn’t notice us as though we do not exist. It does not even try to help to solve any questions. It is connected with presence of some persons at a management of the Club which do not wish to make any dialogue with us. So for example, Spartak fans on the game against the Dynamo were silent the first half of the game. It was connected with weak-willed game of our team in previous games. The same also has served as the reason of the next protest: On game with Saturn during the first time we sang the same song non-stop (Our name is more then money). UT: Have your group political tendences ? 9. Fratria outside of policy. However in general our ultras and hooligans are right-handed (NS/WP). UT: A city can be something special for a fan, are you proud of your city? 10. Yes we are proud with our city – Moscow. First of all we proud about the history of our city, its architecture, its beauty. Moscow is one of the biggest cities in the world! Besides, Moscow is city – the Hero. This rank has been appropriated after the Second World War. In a word, Moscow the best city in the World!!! UT: What is your opinion of the Ultramovement in Europe, which scene are in your view the best and which scene have a good development? 11. Most of all I like shows which are made on the terraces by French, Italian, Serbian and Polish ultras. It is that to what we aspire. Very much pleases, that ultras-movement has not bypassed the party and our brotherly countries – Ukraine and Belarusia. Their shows become more and more difficult and more interesting with each match. 12. 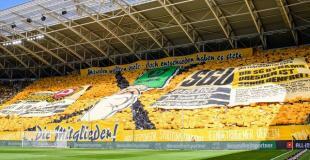 Good luck and with best wishes to your web-site Ultras Tifo. Thank you for the interview, and Ultras-Tifo.net wish you luke for your future!